Last week, Lord Hutton of Furness released his long-anticipated report [pdf] recommending changes to the future of the British public employee pension systems. It contains some pretty stark recommendations, especially in comparison to most of what has been suggested in America. 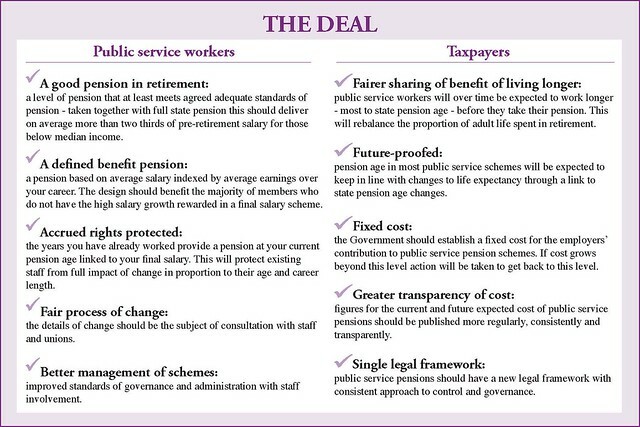 For instance, while many American public pension reform proposals include changing the pension calculations to the final five years’ salary rather than the final three (to prevent so-called “pension spiking”), Lord Hutton’s recommendation is to calculate pensions based on average career pay. Additionally, he would greatly increase the retirement age in the uniformed services (police, firefighters, military) to 60 years, as much as a 10 year increase. Generally, public sector workers will expect about a five year increase in age of retirement. Here is what the Hutton Report calls “The Deal,” which helpfully reminds us that what’s really at issue is negotiations between public sector employees and taxpayers. Here’s a good summary of provisions by the FT. Here’s the Treasury FAQ. This entry was posted in Pensions and tagged FT, Hutton Report, Lord Hutton, pension, public sector workers, reform, retirement on March 17, 2011 by Daniel M. Rothschild. This stikes me as exactly right. A little background on basic public finance is in order. The purpose of taxes is to raise money for necessary governmental functions. To that end, economists frequently prescribe that rates be low and broad in order to minimize the impact on consumers’ behavior — so-called tax neutrality. This is because taxation should be about raising revenue, not changing behavior. Some economists tweak this prescription through the Ramsey Rule, which holds (in a nutshell) that the more influenced by tax rates consumers are (demand elasticity) the less something should be taxed (and vice versa). Sin taxes are the opposite; they’re about reducing a behavior that policy makers judge to be morally offensive (like many people view smoking). Cell phone taxes above regular sales taxes levied by states and localities do not fit any of the four rationales provided here. On the one hand, taxing them at over twenty percent of a user’s bill is hardly neutral. Nor does it likely fit the Ramsey Rule prescription; consumers respond to cell phone taxes by buying less of it or by avoiding taxes by pretending to move. (Just look around you at how consumer takeup and use of cell phones has changed as prices have fallen over the last decade.) Cell phones are not sinful or offensive. And there’s no serious case to be made that the social cost of cell phones exceeds the cost born by users. In short, by any principle of public finance, high cell phone taxes are a bad bad bad idea. Cell phones are, most people’s revealed preferences show, a great thing. There’s simply no case under the principles of tax neutrality, the Ramsey Rule, sin taxes, or Pigouvian taxes to tax cell phones at these high rates. Policy makers would be well advised to cut rather than hike these rates going forward. This entry was posted in Tax and Budget and tagged BNA, California, percent, Ramsey Rule, tax, tax rates on March 14, 2011 by Daniel M. Rothschild. This entry was posted in State Policy and tagged county, migration, Via Radley Balko on June 24, 2010 by Daniel M. Rothschild. Eileen Norcross and Andrew Biggs have a new paper out this morning entitled “The Crisis in Public Sector Pension Plans: A Blueprint for Reform in New Jersey.” While it’s focused on New Jersey, it does an excellent job of outlining the larger problem with state pension plans nationwide and what policy makers can do about it. New Jersey’s defined benefit pension systems are underfunded by more than $170 billion, an amount equivalent to 44 percent of gross state product (GSP) and 328 percent of the state’s explicit government debt. Depending on market conditions, the state will begin to run out of money to pay benefits between 2013 and 2019. The state’s five defined benefit pension plans cover over 770,000 workers, and more than a quarter million retirees depend on state pensions paying out almost $6 billion per year in benefits. Nationwide, state pensions are underfunded by between $2.8 trillion and $5.2 trillion, some 20 to 37 percent of America’s annual output as much as $3 trillion, approximately 20 percent of America’s annual output.. Extend the defined contribution plan already available to state university faculty and staff and the state’s Defined Contribution Retirement Program to all state employees. Reduce or freeze cost of living adjustments (COLAs) to reduce the state’s unfunded liability. Transition non-vested workers to defined contribution plans. This entry was posted in New Publications, New Research, Pensions, Tax and Budget and tagged Andrew Biggs, Defined Contribution Retirement Program, GSP, New Jersey, pension, pension plans, percent, public pension, public sector workers, research, retirement, union on June 23, 2010 by Daniel M. Rothschild. Though suburban cul-de-sacs have long been attractive as quiet, safe places for families, their disadvantages are becoming clear. One of the biggest problems is interference with motor- and foot-traffic flow. Research by Lawrence Frank, Bombardier Chair in Sustainable Transportation at the University of British Columbia, looks at neighborhoods in King County, Washington: Residents in areas with the most interconnected streets travel 26% fewer vehicle miles than those in areas with many cul-de-sacs. Recent studies by Frank and others show that as a neighborhood’s overall walkability increases, so does the amount of walking and biking—while, per capita, air pollution and body mass index decrease. Last year, Eileen Norcross wrote about Virginia’s ban on future cul-de-sacs, arguing for internalizing the externalities associated with them rather than banning them outright. This entry was posted in City Life and tagged Eileen Norcross, King County, Lawrence Frank, research, Washington Residents on May 19, 2010 by Daniel M. Rothschild. In the coming month, this page will explore cities in the same spirit as the person who thrills at urban life more than any other kind. He or she may find rural or suburban settings likable enough, but bliss as a traveler means arriving at a downtown train station armed with a map, a comfortable pair of shoes, and endless walkable blocks to explore. And everyday living? The lover of cities craves bustle if not always hustle, contact with different kinds of people, the anonymous solitude that masses provide as well as lakefronts, and every benefit of civilization that requires a certain scale before it is a daily possibility. Today’s offerings include an interview with Portland’s iconoclastic mayor Sam Adams and a list of free things on Craigslist in some major and minor cities. This entry was posted in City Life and tagged Conor Friedersdorf, Sam Adams on May 11, 2010 by Daniel M. Rothschild. Thus begins David Halbfinger’s Week in Review essay on New Jersey in today’s New York Times. New Jersey’s tough-talking new governor, Christopher J. Christie, the first Republican elected in 12 years, is grappling with a deficit in the billions by squeezing nearly everyone — school children, the elderly, mass transit, cities, suburbs, subsidized renters and home owners. This entry was posted in State Policy and tagged labor, New Jersey, New York Times, spending, tax, union, unions on March 21, 2010 by Daniel M. Rothschild.